Cristina Barés Gómez, Sébastien Magnier, and Francisco J. Salguero, eds. 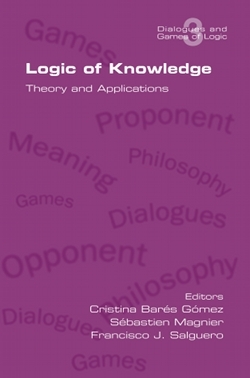 reasoning and knowledge, V. Fiutek studies the other side of the coin of non-monotonic reasoning, namely belief revision, in a dialogical setting. While the paper of P. Seban and H. van Ditmarsch develops a model theoretic semantics for a generalization of Public Announcement Logic (PAL) in order to formalize the concept of ‘having the permission to say something to somebody’. S. Magnier provides the semantic basis for the dialogical perspective on multi-agent public announcement logic with common knowledge. and Redmond who show how the inferential properties of the standard free logics can be expressed in the dialogical framework by delving in the local meaning of the quantifiers. The papers of C. Barés Gómez and of Aude Popek present a new feature of the dynamic turn, namely its sensitivity and ability to deal with historic studies such as the study of conditionals in Ugaritic language and the reconstruction of the medieval theory of Obligationes.